Oscar G. Mayer III passed away last week and with that unfortunate news, the meat-hatin' folks at PETA have opened their mouths to suggest the beloved Wienermobile should be buried with him. PETA, the devastators of all things good, tasty and meaty, have made bold suggestions in the past, but their recent ideas are, to be perfectly honest, troublesome. They've suggested the hotdog-shaped staple of American summer BBQs be buried alongside Mr. Mayer immediately after offering their "condolences and support during these difficult times." 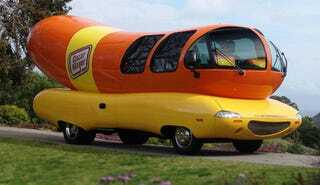 They then conjured this tasty little morsel for you all to chew on; "(The Wienermobile) traverses the countryside and entices children to try Oscar Mayer meats, which can set them on the road to developing life-threatening illnesses."